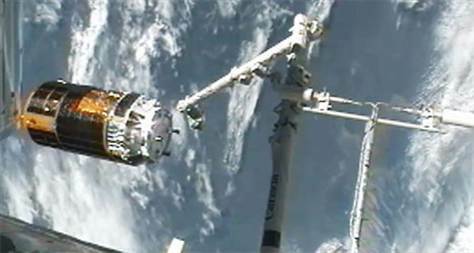 Kounotori, released from the station’s robotic arm (Credits: NASA). Kounotori, the third Japanese HTV resupply vessel to the International Space Station, undocked as planned on September 12 – then quickly leapt away from the station. The automated vessel had initiated an abort maneuver, in response to a computer failure, designed to take it far enough away to safeguard the station. The root cause of the incident is still under investigation. The undocking had been delayed several days to accomodate September 5’s unscheduled spacewalk. Kounotori, which is filled with trash from the station, is scheduled to burn up in Earth’s atmosphere on September 14 over the Pacific Ocean. For the first time, it will be possible to actually see a reentering satellite’s breakup, since Kounotori has been outfitted with monitoring equipment including a camera. 10 images are expected from inside the HTV during its breakup and 40 photographs after breakup. “Getting data off a satellite that’s coming in and breaking apart is a bit of a trick,” says William Ailor of The Aerospace Corporation, principal investigator for the Reentry Breakup Recorder. The recorder only works once the spacecraft begins to breakup. The device is enclosed in a shell connected with plastic bolts. As the spacecraft heats up, the bolts will melt, releasing the recorder. Data on the vessel’s position, acceleration, and temperature will be used to improve reentry predictions and ultimately to improve spacecraft design. Eventually such data collectors may be outfitted to all spacecraft, similar to the ubiquitous black boxes on aircraft. The supply vessel was the third in its line, supplied by Japanese space agency JAXA as its contribution to operational support of the ISS. At least four more such supply vessels are planned, although negotiations between NASA and JAXA for additional supply missions is expected. Kounotori spent 47 days docked at ISS, where it delivered food, clothing, an aquatic habitat, and five cubesats among other equipment, as well as assisting with reboost maneuvers of the station. The next supply mission to ISS will likely be SpaceX’s Dragon, now scheduled for an October launch.